The Apatosaurus was originally misnamed as the Brontosaurus. Othniel Marsh first described it in 1877. Marsh, soon after, found another specimen, which he classified as another related genus. It was later established, however, that the two specimens were in fact the same genus. Thus they were combined as the Apatosaurus. A head was never discovered actually attached to the neck. For a long time, a Camarasaurus-like head was used in the Apatosaurus display, which was later, replaced with a diplodocus-like head. However, it was later determined that a head found close to an Apatosaurus skeleton was most likely the animal's head. The Apatosaurus has been very popular in the media, making appearances in 1935's The Lost World, 1933's King Kong, and as the main character, Littlefoot, in the children's animated movie series, The Land Before Time. Right hindfoot of the Apatosaurus ajax. 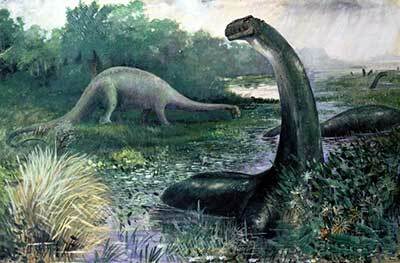 The Apatosaurus and other family related dinosaurs are among the largest land animals ever to have walked the earth. It's name, the deceptive lizard, was given because the chevron bones look a lot like the marine reptile, Mosasaurus. It had a head the size of a horse, and a brain the size of a cat. 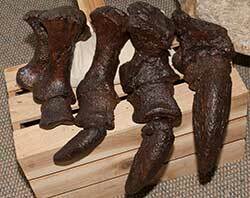 Each foot, like many other sauropods, had one claw on each forelimb as a defense. The neck was long and thick, with a short stocky body, heavy legs, and a whip-like tail, which could possibly have given off a whip crack as loud as a cannon. The lifestyle of the Apatosaurus has long been under debate. Early on it was thought to be too massive to support its own weight and therefore would have spent their time submerged partially underwater. This assumption, however, was later rejected and they are now considered to be grazers using their head and tail to balance each other, and feasting primarily on plant growth that grew near the ground. However, the back legs are longer than the front legs, which may mean that they would rear up to eat from trees. The stance was considered earlier to be sprawled out to the sides as most modern reptiles are, but an upright stance is now considered to be probably correct. Its teeth resembled chisels making them suitable for its herbivorous diet.